The largest style of boat. Class 6 encomposses all the features of the previous 5 classes of boat. The width at the transom of these boats is about 144'. typically there is a rear cabin. If there is an extended hardtop over the rear deck, it is usually attached to a radar arch. The bridge is located above the salon cabin and forward of the rear hardtop and may have a hardtop of it's own. Some additional features include swim platform, pulpit, arch, and an extended hardtop over the rear deck or over bridge. 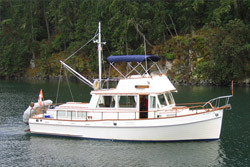 With flying bridge, bow pulpit, swim platform and 2 piece cover.